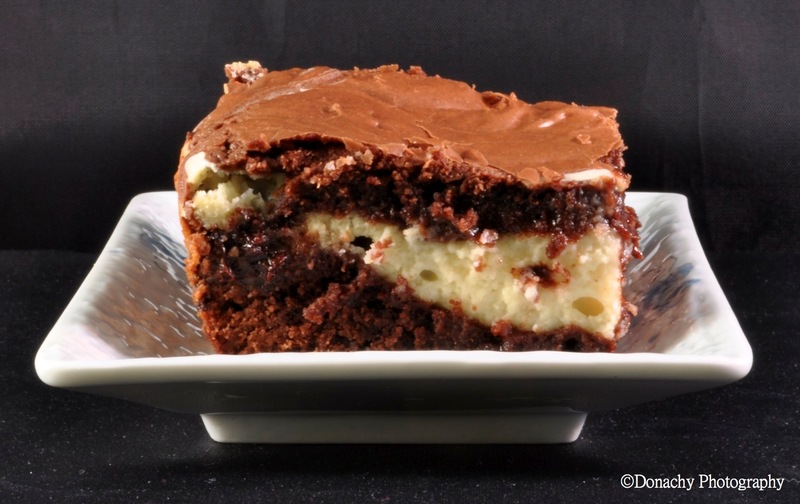 Fudge-like brownie batter swirled with chocolate chip cheesecake make this decadent dessert irresistible. As we go through our annual shopping list, I have to wonder why I thought I needed twenty pounds of chocolate chips! It is a challenge to shop for a whole year in one fell swoop. In most regards, we were really accurate, but I must have been suffering from a chocolate craving while we were in Costco! I did make it through about five pounds so far. With 15 pounds remaining and big chocolate lovers around, I am inspired to keep baking wickedly chocolate confections. Preheat oven to 350 degrees F (175 degrees C). Grease a 8-inch square baking pan or baking dish. Combine cream cheese with 1/4 cup sugar, 1 egg, and vanilla in a mixing bowl; beat until smooth. Stir 1 cup chocolate chips into the cream cheese mixture. Set aside. Fill a saucepan with water and bring to a simmer. Set a heatproof mixing bowl over the water. In the mixing bowl, combine butter with the remaining 1 cup of chocolate chips; stir until just melted and blended together. Mix in the remaining 1/2 cup sugar and 2 eggs in a bowl. Sift together flour, baking powder, and salt. Stir flour mixture into sugar and egg mixture. Mix in chocolate-butter mixture into flour mixture so that it is evenly blended. Pour half of the batter into the prepared baking pan. Spread the cream cheese mixture over the chocolate layer. Top with remaining chocolate mixture (this doesn’t need to completely cover the cream cheese layer). Using a knife, swirl the top chocolate layer into the cream cheese to make a marble pattern by cutting the blade through the mixtures in a swirling pattern. Bake in preheated oven at 350 degrees F (175 degrees C) for 25 to 30 minutes, or until top is cracked and edges pull away from sides of the pan. Cool thoroughly. Cut into 12 to 16 squares. Store in refrigerator or freeze. We tried the brownies cooled on the counter and chilled in the refrigerator. We preferred them chilled in the refrigerator. I generally don’t like cheesecake, but this looks really delicious. They sell 20 pound bags of chocolate chips at Costco? Do they sell butter in bulk? If so, I may need to take more than a recipe away from reading your blog. Thanks for sharing. To be precise, they sell 19 lb bags of chocolate chips at Costco. And yes, they sell virtually everything from jelly beans to butter to meat to bread in bulk. We love it there. Even before we moved to bush Alaska, when we were in California we had a Costco membership and bought many of our staples there. For example, we would buy pork chops there in bulk, repackage them in smaller portions and freeze them when we got home. In Alaska, we buy a year’s worth of groceries in one day – everything from honey to frozen berries to cereal. There is a membership fee for Costco, but we spend enough there to receive back a small rebate at the end of the year. The employees are helpful and the quality of Costco products is, in our opinion, superior to other, similar stores. They also sell many other items: cameras, books, magazines, paper, lamps, chairs, cookware, plates, computers, TVs, gardening products and even various kinds of plants and flowers. And eye glasses & contacts. I think I’d have to shop for a new wardrobe to squeeze the excess baggage into, if I too many of those delectable little devils sitting around. Chocolate and cheesecake … two of my greatest weaknesses in the goodies department. Those do look good! Hi Orples. Yes, these were amazing – my new favorite brownies. And if we didn’t give most of our baking away, we’d need a bigger boat to keep us from sinking! Man that looks absolutely amazing! I would love to try some. I’d love to know what happens! All of your photos are beautiful and everything looks delicious! Those brownies look seriously mouthwatering! One interesting thing about living up here is that there are almost no bugs. And it is very dry. Both make for storing food for a year a lot easier. Hi, I made these brownies for my annual hanami boat trip last weekend – they were a great success! Indeed at the end of the day the leftover brownies disappeared in very obscure circumstances…thank you so much for the recipe.